There exist many concepts and rules by which we are bound, some of which we may be aware and some of which we may not be aware. Those concepts and rules of which we are aware exist throughout nature and space because we can observe them and learn them, manipulate them and control them, and hear them and speak them. Those concepts and rules of which we are not aware exist because we cannot observe them and learn them, manipulate them and control them, and hear them and speak them. In a sense, we are bounded by that which we can know and cannot know – although those boundaries can and will change throughout the course of history. It’s interesting to think about our intellectual boundaries, limits, and intersections because they can be sliced and diced a thousand and one different ways. To a chef, his or her capacity may be bound by a colander, letting some things in and others out, clogged and dirty at times and crystal clear at others. To a biologist or chemist, he or she may see it as some semi-permeable membrane that expands and contracts, filters substances based on the needs of the whole system. And to an astronomer, the boundaries may be the vast unknown of our universe: with new discovery always comes more knowns coupled with more unknowns. Regardless of the profession, it’s valuable to think about. For me, I’ll gladly wear the shoes of a different scientist each waking day but to start, here are a couple different categorizations of our intellectual boundaries, just to jot some thought. Think of our intellectual capacity as bounded by one big room. This room can grow as it’s supported by more material, can shrink with the absence of structural connections, and can lose energy with a loss of insulation, cracks in the windows, etc. It can become more complex or simple in a hour’s time with the addition or removal of new features and can take on a new look and persona with the manipulation of a few simple characteristics such as paint and fixtures. You get the point. Walls – The walls are the support and protection, and are the primary means by which we are bound. The walls are our rules of lateral movement, being, and knowing. In a room of infinitesimal walls, we’ll find just as many corners (getting us ever close to the perfect circle) but we’ll still be limited by a surrounding perimeters. In our room, the walls are our physical concepts, our school subjects, our theorems and laws, our rules of society. Floors – The floors are our foundation. Without the floor we would not be able to maintain our position and as a result, move from one position to another. The floors are our foundation for thought – our family, our circumstance, our physicality – our reference point. Ceilings – The ceiling is our limit. The ceiling provides cover and security, shape and reflection, and a foundation for belief and new thought. The ceilings are our hypotheses and conjectures, our gateway to the unknown as much as it they’re the gateway for belief and clarity of vision. Corners – The corners are the intersections of life, the crossroads of knowledge and new thought. Every corner is formed by the other structures mentioned above. The corners are the relationships, the interdisciplinary nature of life, the idea that everything is connected. Now think a bit differently. Think that our intellectual capacity is bounded by core concepts which, when intersected, form feelings, thoughts, beliefs, and understanding. The core concepts are the things we should study – the basics of existence from which we should gain our foundations. I spoke about studying people earlier, with an overview of Archimedes. For the places, I’ll talk about some of my 2010 visits in the near future. And for time, we’ll it’s the scale by which we can make sense of history, and the perception and reasoning that comes with it. 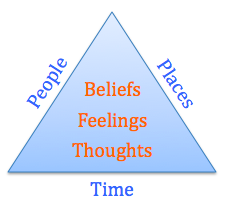 The triangulation of these three things gives an enclosure of feelings, thoughts, and beliefs that form the boundaries of our intellectual capacity. People – We are who we are as much as we are who we’re with (and who used to be with us). To feel, learn, and think, we must understand how other people feel, learn, and think (or felt, learned, and thought). This is core to society, law, science, religion, and everything else. Places – We are who we are in the place that we are. If I were in a different place right now, my actions, feelings, thoughts, and beliefs may be different as a result. Place is a part of circumstance which most certainly contributes to our thoughts and beliefs. Time – We are who we are because of the historical context in which we live. Time forms this context and provides structure to the way we think, how we can act, and as a result, what we might think and believe. Feelings, Thoughts, & Beliefs – Our coordinates at any one time (say, x=people, y=place, z=time) describe who we are. The result of who we are is an output of feelings, thoughts, and beliefs. These form the boundaries, limits, and intersections of our intellectual capacity. Change coordinates, and we’ll find new outputs. And the most important thing to note: as with mathematical coordinate systems, there’s no limit to our coordinate system space, only to a local solid surrounding a group of coordinates. 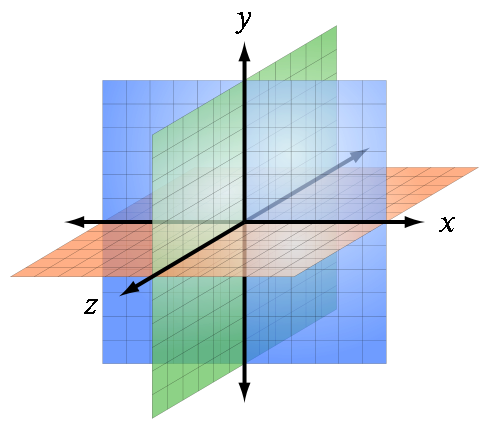 Limits may exist on my axes, by not on the coordinate system as a whole.